Uncharted 4 developer Naughty Dog has slashed prices on multiplayer items as part of a summer promotion. Uncharted 4 multiplayer is busier than ever thanks to the release of the Lost Treasures DLC in late June. With so many things to earn and unlock, you might be tempted to take a little shortcut with some help from your friend Benjamin, or Benjamin’s international relations. Naughty Dog is only too happy to take some of your cash, and to make it more worthwhile for you, is hosting a big sale on Uncharted 4 multiplayer items. 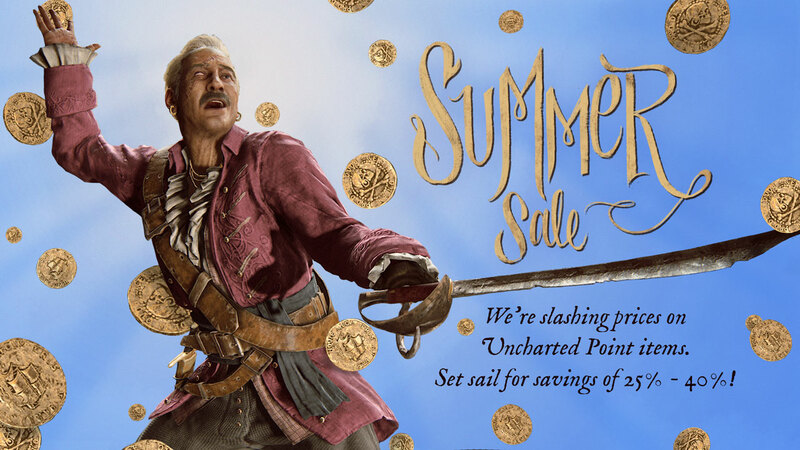 For the next four weeks, through August 17, everything you can buy with Uncharted Points will be discounted from 25% right up to 40%. Individual items like Chloe, the Dread Pirate Drake skin, the P90 and more are all going cheap, and so are bundles like Git Gud and Scalleywag. You can buy Uncharted Points via the in-game store menu or directly from the PlayStation Store, in bundles ranging from 500 to 10,000. Naughty Dog reminds players that the bigger packs include bonus points, too. Naughty Dog has said it has big plans to keep updating Uncharted 4 multiplayer with new content right through into 2017, presumably funded at least partially by Uncharted Points.